Spomments is my word for SPAM comments on my blog. I know you seldom see any, but that’s because I have two awesome SPAM filters: Akismet and CommentLuv Premium’s GASP. I also curate the comments a couple of times a day, sometimes releasing folks who have been unfairly shuttled into the SPAM bin, sometimes relegating folks there. How do I determine what’s a spomment and what isn’t? Oh, that would be telling! I’ll tell you this, though: Even if you come here planning to drop a link on me to a site that has nothing to do with my blog, if you actually read my post and actually leave a comment like one human being to another, your comment will appear on my blog. Unless the link is an unpleasant one, like “How To Fool Blogmeisters” or some such, your link will also appear. If you drop a spomment on me and I don’t catch it, but later realize it was a spomment, I might hunt it down and root it out. If you’ve left me a real comment and I’ve axed it, I do apologize. Next time you’re kind enough to leave me a note, please make it more personal than, “Nice post!” Those look like SPAM and, if I don’t know you, I’m liable to delete. The spomments that really drive me crazy, though, are the mean ones, the goofy ones, the ones that come to me fifty almost-identical on the same day, the ones with eleventy-gazillion links, and the ones that have obviously been run through a translation machine multiple times, with a whole set of badly done variations for spammers to cut and paste. 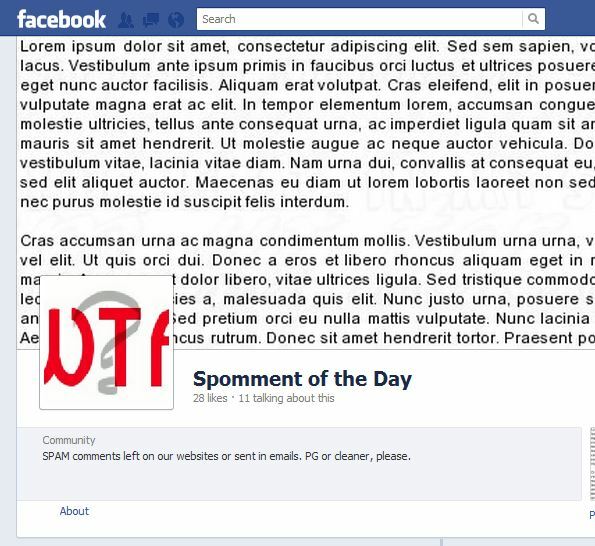 I’ve even set up a Facebook page called Spomment of the Day. If you’re on Facebook, I invite you to join. Please also visit Holly Jahangiri’s new blog, Lost in Translation, to which I will be a regular contributor. How regular, only time will tell. A WRITING PROMPT FOR YOU: A character goes to a party where he or she is having fun, but is followed around by someone trying to sell something inappropriate to the gathering. This entry was posted in April A-to-Z Challenge 2012. Tagged SPAM. Let The Contest BEGIN! !! ! I’ve never had spoments so far but I live in fear of them!